· Automatic return function. | With automatic orientation. · Auto takeoff and landing. | Compatible with Lego parts. · Complete, ready to fly and with 2.4Ghz radio. 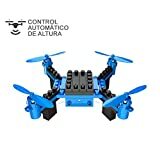 · This starter drone has a very original and innovative design, allows children to mount their own rc drone with lego type parts. It easily works as a school project in which children have to mount their own drone, assemble the components, assemble the protections and understand the functioning of their electrical parts in order to make the drone fly by itself. It is perfect for initiation because it includes features such as auto takeoff, auto landing and automatic height control. It is ideal for indoor flights, although it also flies generally outdoors in low wind. It also allows you to perform acrobatics and 360 degrees at the touch of a button. Features: • Radio-Controlled initiation drone to assemble with lego parts. • Ideal for understanding the operation, electronics and architecture of drones. • Includes automatic height control function: allows the drone to maintain a fixed height in the air, without falling, being able to fly with just one hand! • Automatic return function that allows the drone to return to the station. • Automatic landing and take-off at the push of a button on the station. • Allows acrobatic flights and 360 degrees manoeuvres at the touch of a button on the controller. • Includes a 2.4Ghz station, which allows you to play as many drones as the same as you want no interference problems. Includes: • Drone to mount Rc • 2.4Ghz transmitter • Charger. • Tool. • Spare propellers. • Instructions. • Propeller proctectors. Requires: • 3 x 1.5V AA batteries for the transmitter. Rctecnic.com, model shop and construction with guarantee of confidence, real stock in Spain.